Poles love fruit tarts. They’re nothing like American grocery store style fruit tarts with huge chunks of fruit in a yellow custard, and drenched in a shiny sweet glaze. Those are pretty to look at but I prefer other European pastries that are less sweet. 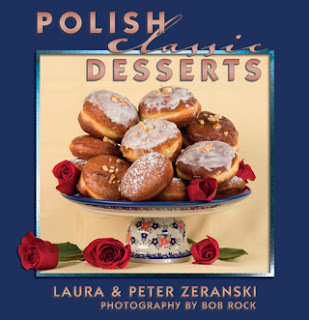 The classic Polish berry tarts we grew up with have fewer ingredients, they are simpler to make, less sweet and focus more on the natural flavors of the fruit. This one is a favorite because it combines the flavors of berries and rhubarb for a wonderful contrast of sweet and tart. Have you been to a farmers’ market yet this spring? As the weather gets warmer, more and more berries are showing up for sale. And since they are usually local and fresh picked, the berries are bright red and super-sweet. Now we’re also seeing rhubarb which is a bakers’ dream ingredient. 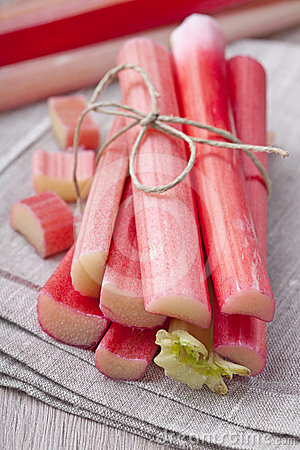 When raw it looks like red celery, and it’s quite tart on the tongue. But when you cook it down with some sweetener, it can add such a beautiful bright fresh note to any fruit it is paired with. This is a favorite “go-to” dessert of ours because it is so easy and frankly flexible. 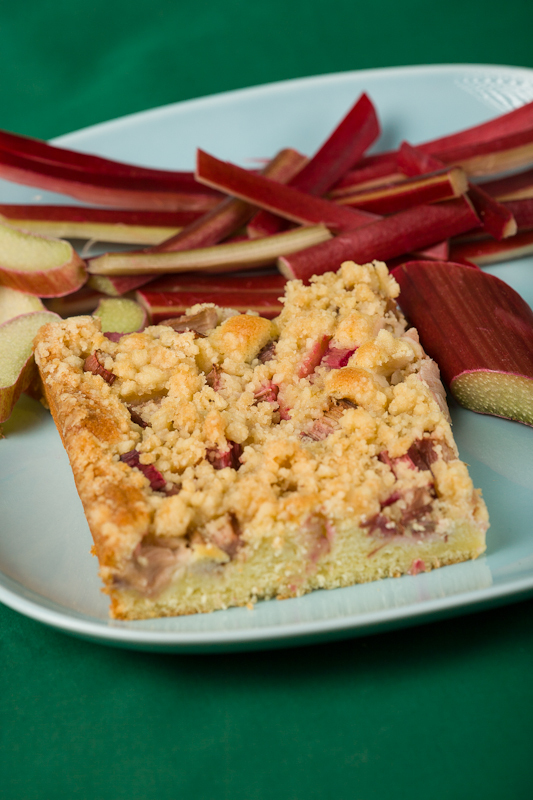 Any berries will work although we like it best when the berries are paired with the rhubarb for a more natural and fresher flavor profile. Preheat oven to 350°F. Butter and flour a 10x15-inch pan. Using a standing mixer, blend the butter and sugar and until pale and creamy. Mix the flour with the baking powder and add to the butter - alternately with the milk. Add the egg yolks one at a time, beating constantly. Add the vanilla and blend thoroughly. In a separate bowl, beat the egg whites until stiff. Fold into the dough and mix lightly. Spread the dough evenly in the prepared pan. 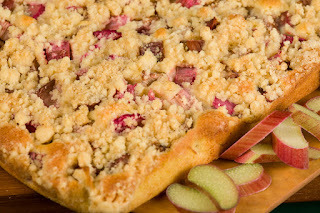 Combine the strawberry and rhubarb pieces and distribute the fruit mixture evenly on top of the batter. Mix the butter and flour until it resembles coarse crumbs. Add the sugar and mix well. Sprinkle the crumb mixture over top of the fruit. Bake for 40 to 45 minutes or until a toothpick inserted in the center comes out clean. If the crumb topping starts to brown too quickly, place a piece of aluminum foil over the top of the cake. Remove from oven. Cool and cut into portion-sized squares. A scoop of vanilla ice cream on the side would be a no-brainer! * Note: if your fruit pieces are too small they could render too much moisture and the middle of your tart will be wet. If so, bake a little longer, keeping an eye on the crust not getting too dark.